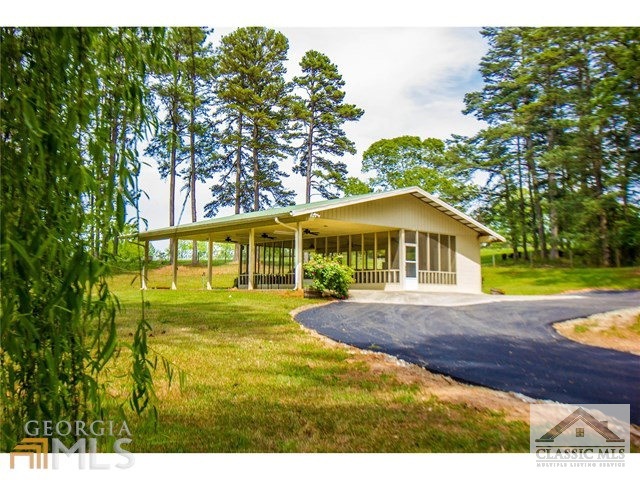 Premiere 30-acre estate located minutes from Hwy 316. Great proximity to Athens and Atlanta. The home's main level features an upgraded chef's kitchen, large family living room, Master suite, formal areas and a half bath. Upstairs there are 3 bedrooms, 2 full baths, office areas and a lounge area. The terrace level includes a large bedroom suite, exercise/office, a second kitchen and a huge living/game room area. The pool area features a recently renovated pool and spacious hardscape area with a stone outdoor fireplace. The immaculate grounds include a six stable horse barn with plenty of storage, a beautiful lake and pavilion, a second detached garage in addition to the attached garage surrounding a large parking plaza. Additional 96 acres is available! 986 Austin Road, Winder GA 30680 is a Home, with 6 bedrooms which is recently sold, it has 0 sqft, 25+ - 50 sized lot, and Attached parking. A comparable Home, has 5 bedrooms and 2 baths, it was built in and is located at 170 Woodlawn Ave Winder GA 30680 and for sale by its owner at $ 314,900. This home is located in the city of Winder , in zip code 30680, this Barrow County Home, it is in the No Recorded Subdivision Subdivision, and Bellingrath Plantation are nearby neighborhoods.